This carefully researched article by Amy Worthington first published by GR in July 2004 sheds light on the unspoken and forbidden truth: geoengineering and environmental modification (ENMOD) techniques for military use. It is worth noting that geo-engineering is casually dismissed and excluded from the debate on climate change. It is a scientific taboo. The mainstream media has chosen not to provide coverage of of aerosol and electronic operations for military use and their underlying impacts on the global environment. 14. Agency for Toxic Substances and Disease Registry, July 1999; For information on thorium in chemtrails: “The Methodic Demise of Natural Earth,” Dr. Mike Castle, 3-27-04,http://www.willthomas.net . 16. “Elf Radiation is Confirmed,” Clifford Carnicom, 11-17-02; “Elf Disruption & Countermeasures,” Clifford Carnicom 11-27-02; “A Proposal of Cascading Resonance,” Clifford Carnicom, 4-21-03. Seehttp://www.carnicom.com for these and numerous other frequency studies; also “Electromagnetic Waves Linked to Children’s Brain Tumor,” Kyodo News Service, 6-8-03. 30. “Air Force Increases Rank of Lie,” letter by Walter M. Washabaugh, Colonel, USAF, denying the existence of chemtrails, received by e-mail on May 22, 2001 and posted at http://www.carnicom.comby Clifford E Carnicom, May 22 2001. 37. Secondary school text book: Science I Essential Interactions, published by Centre Point Learning, Inc. of Fairfield, Ohio. 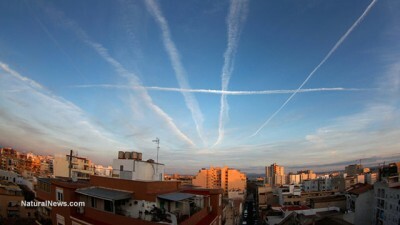 See “Chemtrail Sunscreen Taught in Schools,” William Thomas,http://www.willthomas.com .